Guest post by Renjun Bian. Ms. Bian is a J.S.D. candidate at UC Berkeley School of Law, where she conducts research on Chinese patent law and policies. Her dissertation focuses on patent litigation and valuation. Before coming to Berkeley, Ms. Bian studied Chinese law at Peking University, where she earned an LL.B. Ms. Bian also holds an LLM from Berkeley and interned at King & Wood Mallesons’ Silicon Valley office. The opinions expressed are her own. Below, she describes findings from her forthcoming article in the Berkeley Technology Law Journal. As the Chinese government continues to stimulate domestic innovation and patent activities via a variety of policies, China has become a world leader in both patent applications and litigation. These major developments have made China an integral venue of international patent protection for inventors and entrepreneurs worldwide. However, due to the lack of judicial transparency before 2014, we had virtually no access to Chinese patent litigation data and knew little about how Chinese courts adjudicated patent cases. Instead, we were left with a variety of impressions and guesses based on the text of Chinese law and the limited number of cases released by the press; for example, that Chinese courts have a strong bias toward domestic companies over foreign ones, to protect the local economy; that injunctions, either preliminary or permanent, are difficult to obtain under Chinese law; that monetary damages granted by Chinese courts are extremely low, and insufficient to compensate patent holders; etc. Taking advantage of ongoing judicial reform in China, including mandated public access to all judgments made since January 1, 2014 via a database called China Judgements Online (CJO), I wrote a paper called “Many Things You Know about Patent Infringement Litigation in China are Wrong” in 2016 (available at SSRN: https://ssrn.com/abstract=3063566). It analyzes 1,663 patent infringement judgments – all publicly available final patent infringement cases decided by local people’s courts in 2014, and surprisingly finds out that most of the long-standing beliefs about patent enforcement in China cannot be supported by empirical data. 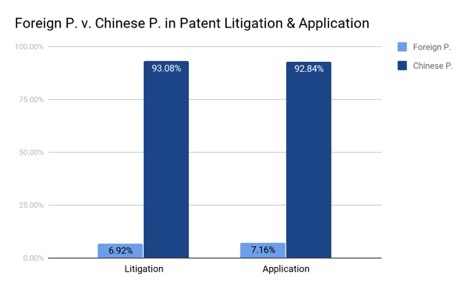 Not surprisingly, the overwhelming majority of patent infringement cases in China (93.08%, or 1,548) were litigated by Chinese patent owners or licensees. Foreign plaintiffs accounted for only 6.92% (115) of 1,663 decisions included in the population. This percentage – although it seemed intuitively low – represented the ratio of patents granted by SIPO to international patent applicants. According to statistics released by SIPO, 93,285 patents were issued to foreign individuals and entities in 2014, making up approximately 7.16% of all 1,302,687 patents granted by SIPO that year. Foreign plaintiffs were more likely to win and receive injunctions than their Chinese counterparts in patent infringement cases brought in China. Moreover, damages awarded to foreign patent owners (￥201,620.45, or US$32,837.21) were almost three times higher than those awarded to Chinese patent owners (￥66,217.93, or US$10,784.68). The important implication here is that Chinese courts, while not preferring foreign parties to domestic ones, certainly did not protect the local economy at the expense of foreign companies in practice. (1) Plaintiffs won in 80.16% of all patent infringement cases included in the population. Such a win rate was higher than its counterparts in many major countries – Germany (approximately 66%) and the United States (approximately 60%), for example. (2) In China, permanent injunctions were automatically granted in most cases (93.76%), based on a finding of infringement. (3) Damages awarded by Chinese courts are frustratingly low (US$4,885.99 in median). (4) Design patents were overrepresented in infringement litigations in China, indicating that design patent owners are more likely to enforce their patents after issuance than owners of invention patents and utility models. (5) The overwhelming majority of patent infringement lawsuits in China involved mechanical patents (84.64%). Electrical (13.79%) and chemical (1.57%) patents made up only a rather small portion of all decisions. (6) On average, patent owners had waited for approximately half of the protection term of their patents (48.15% for invention patents, 65.60% for utility models, and 45.50% for design patents) before enforcement. (7) Patent infringement cases were highly concentrated in the East Coast region – the most economically developed part of China. The nine provinces in the East Coast region heard more than three quarters of all patent infringement lawsuits in 2014. Based on common knowledge 15 or 20 years ago, filing a patent in China might have seemed like a poor investment. But the change since then has been dramatic. China has steadily strengthened its IP system and now leads the world in IP litigation. Foreign companies win most of the time against Chinese adversaries. Serious investments are being made to improve training of judges and build strong, experienced IP courts. There are still weaknesses, but the trajectory is fairly clear. Instead of mocking companies that file in China, the real question mark should be over those who ignore the world’s biggest market where IP rights are increasingly relevant and enforceable. This applies to patents as well as trademarks. Ignoring the data and laughing off China may seem OK for those whose focus is solely within the borders of the US (and on the distant past). But even if your market is strictly within the US, investing in IP in China can help reduce the risk of the world’s biggest exporter shipping copies of your product all over the world, including into the borders of the US. A smart patent strategy needs to consider IP in China, both for protection within the Chinese market and for protection from the manufacturers and exporters of China. Given the nature of Chinese companies and the absurdly low damage awards even for foreign companies, participating in IP litigation in China is like playing whack-a-mole. It is true that there is no judicial transparency, but the plaintiff wins more indeed. Doesn’t this fact suggest the opposite—that foreign patent holders in China are more cautious about which claims they bring? The implicit assumption you’ve made is that foreign and domestic patents in China are infringed at exactly the same rate, but that might not be true. I’m always amazed when a domestic client goes after a Chinese patent. Like … you can’t find a better use for that money? My goodness, let me suggest a few hundred alternatives. But a big part of the push to file in China is, undoubtedly, what I call “investor perception.” These well-heeled people usually aren’t exceptionally intelligent, as most of us who work regularly with them understand perfectly well. They are exceptionally greedy, however, and also exceptionally shallow. Most of their lives are devoted to looking around and seeing what their “successful” friends are doing and then copying them just as a baby chimp copies his soft furry mommy. MM, I was amazed by your comment. I had always assumed that, if you don’t pursue patent protection in China, you have no basis to complain to “the authorities” there, when the knock off enterprises get going in China. This is why folks file there, isn’t it? Of course, having a patent in China is no guarantee that you can arrest the knock off activities. I assume it is a bit of a Hydra Head or Whack-a-Mole game. As soon as you shut one Chinese copier down, the next starts up. Or maybe not. I just don’t know. But I recall that old Chinese curse “May you come to the attention of the authorities”. What a dreadful fate that is, I imagine. Why would you be amazed? It’s Malcolm and it is an anti-patent comment. Like nearly most ANY comment from him over the last DOZEN years here, a comment by Malcolm is pretty much guaranteed to malign someone wanting a patent. Max, seriously? MM is so anti-patent that he makes the SCOTUS look like they are pro-patent. ..the cognitive dissonance on display yet again…. Do you inform your “clients’ of your disdain for them?